Villa Solare rests on the promontory looking towards Positano, surrounded by terraces from which you can enjoy one of the most beautiful panoramas on the Amalfi Coast. The villa is situated in a residential complex surrounded by rich vegetation with Mediterranean flowers and plants, and which you reach via a convenient modern cable car providing an unforgettable panorama. Easy access to the beach via a lift makes this place unique, especially for lovers of the Mediterranean sea; the route is very scenic and the beauty of the beach when you arrive almost takes you by surprise and is an unforgettable experience. 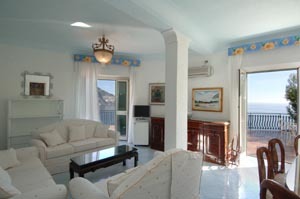 The villa has every modern convenience: satellite-TV, air-conditioning in all the rooms, washing-machine, dishwasher. The private 9x4m swimming-pool is wedged into the rock and lies on a terrace from which you can admire the enchanting panorama of Positano. On request you can book a pay car-parking space, but the property is well-served by a public bus service which links up with the center of Positano. The use of the beach is reserved for guests of the residential complex and of the nearby hotel. (Access is via about 30 steps) GROUND FLOOR: living/dining-room with access to the panoramic terrace, inhabitable kitchen with access to the terrace, 1 bathroom with shower, double bedroom with bathroom with shower. FIRST FLOOR: 1 double bedroom with bathroom with bathtub and access to the balcony with a view of the sea, 2 double bedrooms each with bathroom with shower and access to the terrace with view of the sea. Air-conditioning in all of the rooms, satellite-TV, washing-machine, dishwasher, DVD, private swimming-pool.